This spacious & tastefully decorated home sits at the edge of Dingle town in a quiet development. 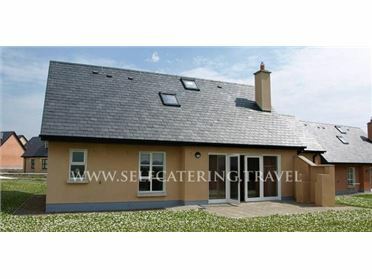 It has has all you will need to enjoy a fantastic holiday on the spectacular Dingle Peninsula. With a private garden that has a patio & barbecue area it's serene location offers a home from home to relax in. With 4 en suite rooms all sleeping 2 guests this house accommodates 8 people with all facilities you may require. The sitting room has a wood burning stove, tv & DVD player, WI-fI & books to assist you explore the area. The kitchen has all you will need to cook & cater for your guests. The dining area sits 6 people & the breakfast bar sits 2. The utility has a washing machine & tumble dryer along with a clothes line in the garden. The house is very spacious allowing everyone to relax in comfort. The master suite on the first floor has a super king size bed with it's own jacuzzi in the the en-suite & a walk in wardrobe. The other 3 bedrooms on the ground floor have double beds & all are en suite.